The week 12th November marked the start of the next quarterly round of committee meetings and it commenced with a meeting of the Progression Working Party. Since the last meeting, members of the committee have spoken to many Court members to get a better understanding of the how the progression through the Court has worked in the past and how it should work in the future. We noted that a significant change in the last twenty years is that there are fewer Past Masters and that the major employers they represented have gone. The Progression Working Party has submitted several proposals for consideration to ensure the Court remains representative of the current river community. Each year at the Benefactors’ Lunch we celebrate those whose contributions have enriched the Company and made it what it is today by reading their names and toasting their memory. 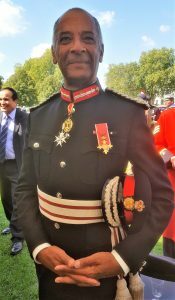 The speaker at this Freemen’s lunch was an old friend, Sir Kenneth Olisa OBE, the Lord Lieutenant of London. (see photograph below) As a successful businessman and major benefactor himself he was well qualified to talk about the pleasure in giving to good causes – as well as giving us a few amusing insights to his career and some of the people he has encountered. He confessed that he was not a waterman himself but that the joy of sitting on the bank was that he could watch the bodies floating by of those who had caused him grief. That same evening I attended the Court & Livery Dinner at the Saddlers Company, my first visit to their Hall, and it did not disappoint! It is always interesting to learn how other companies organise themselves. In the Saddlers it is the responsibility of one of the junior wardens to make all the menu selections and, seated next to her at dinner, I had an entertaining insight into the joys and perils of menu tastings and wine selections. Their speaker was David Railton, the grandson of the WW1 military chaplain who was the originator of the idea of bringing back from France the body of an unknown soldier to be buried in Westminster Abbey in the Tomb of the Unknown Warrior. While most of those dining knew the broad history, the speaker’s family link, so close to the hundredth anniversary of the Armistice, made it especially poignant. Although not an official duty there was an amusing reversal of roles when, later that week, I went as Susan’s guest to an Anglo-Norse reception for HM The Queen and HM King Harald V of Norway where Susan, as one of the hosts, presented me to their Majesties! That evening I went to a discussion organised by the Guild of Entrepreneurs on ‘Does a formal education make the entrepreneur’. It was a lively debate with the panel a mixture of self-made entrepreneurs and academics in business studies. There were many contributors from the floor, but I am not sure that anyone came away with their views radically changed: my experience is that entrepreneurs are born that way and, while education may refine their skills, the drive to create is innate. After the rough and tumble of a floor debate with the Entrepreneurs, my next official engagement was a rather more sedate lecture at the Drapers’ Hall on ‘Power, Reputation & Influence’ by Deborah Hayes, the Foreign Editor of Sky News who spoke entertainingly – while avoiding controversy – about the twists of a career in journalism. The rest of the week included the rest of the quarterly committee meetings: Apprentices & Training, River & Rowing, Library & Heritage, Kitchen, Almshouses & Charity, Membership, and Fundraising. The Company is dependent on and grateful for these groups of volunteers who contribute their time, experience and skills to make the recommendations and policies that ensure the Company remains viable. Those members of the Company who would like to know more about these committees will be able to find a summary of the Minutes on the website very shortly. The next day I went to a very enjoyable dinner with the Barbers at the Barber Surgeons’ Hall (one learns to be very careful to use the correct nomenclature: the company is never referred to as Barber Surgeons and it’s not the Barbers’ Hall). This was a dinner for masters and clerks so there many familiar faces. As happens so often, I was seated next to interesting people: on one side a former infantry officer with whom I could compare notes, and on the other an orthopaedic surgeon with whom I could discuss hips, having had mine resurfaced in 2017! 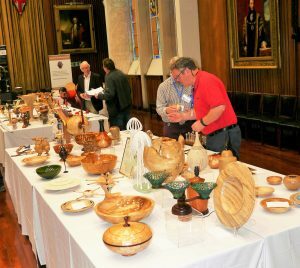 The following Monday, Susan and I were invited to an exhibition of the entries for an annual competition organised by the Worshipful Company of Turners. The Master Turner greeted me on arrival by saying: “now you will see what men do in their sheds at the weekend”! I don’t have a shed, but even if I did I could only aspire to be as skilled and dexterous because the craftsmanship was very impressive. Many of the entries were submitted by craftsmen who described themselves as “hobbyists”, but the delicacy of the work could only make one gaze in wonder. There were also several stands demonstrating electrical lathe turning and, even more fascinating, turning with a traditional pole lathe where the spindle is turned by a cord attached to long springy pole which the operator flexes using a treadle. It looked very energetic! On Wednesday the 18th a small panel, led by Past Master Goddard, interviewed prospective authors for volume 6 of the Company’s history continuing on from volume 5 which went up to 1920. Two promising candidates went away to give some thought as to how they would tackle the task because it will involve more interviewing and picture research than earlier volumes; we shall soon be asking Freemen if they have any suitable material or memories. That evening, Susan and I went to the Mansion House for the Royal Charter Banquet of the Company of Educators. The Educators are a relatively junior company, becoming Livery in 2013, so this was the occasion at which the Royal Charter granted in 2017 was formally presented to the Company. The two principal speakers were the Lord Mayor, Peter Estlin, and one of his predecessors, Sir Andrew Parmley. My last official engagement of the month was Lightermen’s Christmas Lunch in memory of John Henry, held at the Union Jack Club. I had been warned that this would be a “robust” lunch and it lived up to its reputation. I was warmly welcomed and, despite my not being “working river”, I felt very much among friends. I had been warned by my predecessors that I was likely to be pelted by bread rolls, but I took care to befriend the catering manager who ensured that all ammunition had been removed before I rose to speak. I emerged unscathed! November had proved a busy month, so I ended it with two ‘non-official’ occasions which did not require me to remember my Master’s badge, to process anywhere, host anyone, or make a speech: the Glaziers’ Court Dinner, at which I was merely Susan’s guest, and the Henley Town & Visitors’ Dinner to reconnect with the rowing community.